ThingOne was really well behaved this weekend when we visited some friends in Catford. She's a little actress and loves to play for a crowd, so is generally good value when we visit people. What surprised us was that she was also very good when Anne or I held our friends' new baby. ThingOne often gets a bit antsy when Anne holds babies at the NCT things she organises and goes to, so we were wondering how she'd react with both of us and a baby. Conscious that ThingOne's going to have to put up with competition for our affections from next February, we're trying to prepare her and ourselves gradually. As it was, ThingOne didn't bat an eyelid. She even gleefully shouted "Mummy hold baby Mimi" (Mimi = Millie). It might have helped that she was sitting on a friend's lap eating a big bowl of fruit salad at the time. That gives us an idea of a possible distraction for when The Bud arrives. Later we put Millie on ThingOne's lap (ThingOne was on my lap at the time so I could ensure ThingOne didn't try to do Millie any damage). ThingOne wasn't entirely sure what was going on, but didn't seem to mind too much. She's been telling us about Baby Mimi ever since, so Millie obviously made an impression. On Sunday, after returning to Cambridge, we were looking for a wardrobe for ThingOne's room in Habitat and ThingOne took a shine to a toy drum. She'd been so good I bought it for her (soft-touch dad). We had a coffee in Starbucks and I said to Anne that I was enjoying how easy parenting was at the moment, though was aware that things could be tougher once we reach the so-called Terrible Twos. Somewhat predictably ThingOne then screamed ALL THE WAY ROUND THE SUPERMARKET because we didn't let her go on the Bob The Builder ride at the entrance (I'm beginning to resent shops putting these rides in). "BOB!" she screamed as Anne and I tried to stay calm and calm ThingOne. "BOB!!!" I don't really know how she knows Bob the Builder - she's never seen it on TV She saw some Bob toys at her grandfather's house earlier in the year but she seemed to know then who Bob was already. I was looking out for a helicopter toy for ThingOne in the supermarket and found one for 97p. 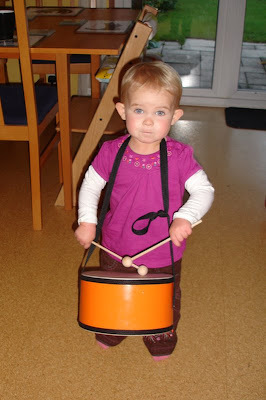 Since she was such a terror I didn't give it to her that day (and she'd had a drum already). ThingOne got upset that I had left for work early on Monday and wasn't there when she got up. "Daddy's left you a present", Anne said to try to cheer her up. Anne handed ThingOne the helicopter and it seemed to do the trick. "Helitoptop!" she exclaimed. Almost immediately though, ThingOne looked concerned, held up her other hand and said "No plane?"